← Oil and the Economy: Where are We Headed in 2015-16? In this post, I will look at the first piece of this story, relating to how the economy is tied to energy, and how the leveraging impact of cheap energy creates economic growth. In order for economic growth to occur, the wages of workers need to go farther and farther in buying goods and services. Low-priced energy products are far more effective in producing this situation than high-priced energy products. Substituting high-priced energy products for low-priced energy products can be expected to lead to lower economic growth. Trying to tackle this topic is a daunting task. The subject crosses many fields of study, including anthropology, ecology, systems analysis, economics, and physics of a thermodynamically open system. It also involves reaching limits in a finite world. Most researchers have tackled the subject without understanding the many issues involved. I hope my analysis can shed some light on the subject. I plan to add related posts later. The economy is a networked system of customers, businesses, and governments. It is tied together by a financial system and by many laws and customs that have grown up over the years. I represent the economic network as a child’s toy made of sticks that connect together, but that can, if disturbed in the wrong way, collapse. The economy is a self-organized system. In other words, it grew up gradually over time, one piece at a time. New businesses were added and old ones disappeared. New customers were added and others left. The products sold gradually changed. Governments gradually added new laws and removed old ones. As changes were made, the system automatically re-optimized for the changes. For example, if one business raised its price on a product while others did not, some of the customers would move to the businesses selling the product at a lower price. The economy is represented as hollow because, as products become obsolete, the economy gradually adapts to the replacement product and loses support for earlier products. An example is cars replacing horse and buggy in the United States. There are fewer horses today and many fewer buggy manufacturers. Cities generally don’t have places to leave horses while shopping. Instead, there are many gasoline stations and parking lots for cars. Because of the way an economy adapts to a new technology, it becomes virtually impossible to “go backwards” to the old technology. Any change that is made must be small and incremental–adding a few horses at the edge of the city, for example. Trying to add very many horses would be disruptive. Horses would get in the way of cars and would leave messes on the city streets. Systems analysts would call a system such as the economy a complex adaptive system, because of its tendency to grow and evolve in a self-organizing manner. The fact that this system grows and self-organizes comes from the fact the economy operates in a thermodynamically open system–that is, the economy receives energy from outside sources, and because of this energy, can grow and become more complex. The name of such a system from a physics perspective is a dissipative structure. Human beings, and in fact all plants and animals, are dissipative structures. So are hurricanes, galaxies, and star formation regions. All of these dissipative systems start from small beginnings, grow, and eventually collapse and die. Often they are replaced by new similar structures that are better adapted to the changing environment. The study of the kinds of systems that grow and self-organize is a new one. Ilya Prigogine was awarded the Nobel Prize in Chemistry in 1977 for his pioneering work on dissipative systems. One writer (in French) about the economy as a dissipative structure is François Roddier. His book, published in 2012, is called Thermodynamique de l’evolution. If the economy is a dissipative system, it is clear that energy must be central to its operation. But suppose that we are coming from a step back, and trying to show that the economy is an energy-based system that grows as more external energy is added. Let’s start even before humans came onto the scene. All plants and animals need energy of some kind so that the organism can grow, reproduce, move, and sense changes to the environment. For plants, this energy often comes from the sun and photosynthesis. For animals, it comes from food of various kinds. Access to adequate food (a source of energy) is one key to winning this competition. Outside energy can be helpful as well. The use of tools is as approach that is used by some types of animals as well as by humans. Even if the approach is as simple as throwing a rock at a victim, the rock amplifies the effect of using the animal’s own energy. In many cases, energy is needed for making a tool. This can be human energy, as in chipping one rock with another rock, or it can be heat energy. By 70,000 years ago, humans had figured out that heat-treating rock made it easier to shape rocks into tools. A bigger step forward for humans than learning to use tools–in fact, what seems to have set them apart from other animals–was learning to use fire. This began as early as 1 million years ago. Controlled use of fire had many benefits. With fire, food could be cooked, cutting the amount of time needed for chewing down drastically. Foods that could not be eaten previously could be cooked and eaten, and more nutrition could be obtained from the foods that were eaten. The teeth and guts of humans gradually got smaller, and brains got larger, as human bodies adapted to eating cooked food. There were other benefits of being able to use fire. With time freed up from not needing to chew as long, there was more time available for making tools. Fire could be used to keep warm and thus expand the range where humans could live. Fire could also be used to gain an advantage over other animals, both in hunting them and in scaring them away. Humans were incredibly successful in their competition with other species, killing off the top carnivore species in each continent as they settled it, using only simple tools and the burning of biomass. According to Paleontologist Niles Eldridge, the Sixth Mass Extinction began when humans were still hunter-gatherers, when humans first moved out of Africa 100,000 years ago. The adverse impact of humans on other species grew significantly greater, once humans became farmers and declared some plants to be “weeds,” and selected others for greater use. Embodied energy stored up in tools and other capital goods that can be reused later. Some of the energy in making these tools is human energy (including human thinking capacity), and some of this is energy from other sources, such as heat from burning wood or another fuel. Human energy–Humans have many abilities they can use, including moving their arms and legs, thinking, speaking, hearing, seeing, and tasting. All of these are made possible by the energy that humans get from food. Wind energy – Used in sail boats and in wind powered devices, such as windmills to pump water. Wind turbines (with significant embodied energy) also generate electricity. Solar energy – Most energy from the sun is “free”. It keeps us warm, grows food, and evaporates water, without additional “help.” There are also devices such as solar PV panels and solar hot water heaters that capture energy from the sun. These should perhaps be classified as tools with significant embodied energy. One key use of supplemental energy is to reduce the amount of human labor needed in farming, freeing-up people to work at other types of jobs. The chart below shows how the percentage of the population working in agriculture tends to drop as the amount of supplementary energy rises. Figure 2. 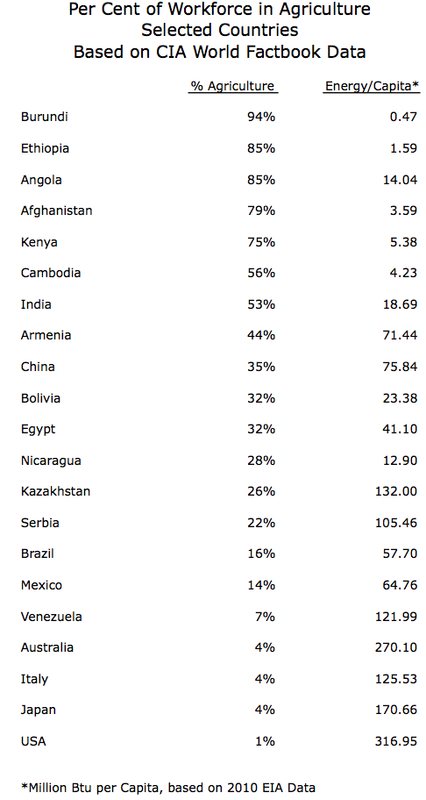 Percent of Workforce in Agriculture based on CIA World Factbook Data, compared to Energy Consumption Per Capita based on 2012 EIA Data. Locally gathered dung, wood, and other biomass. Allow those people to have much more “stuff”–large, well-heated homes; cars; lighting where desired; indoor bathrooms; grocery stores filled with food; refrigeration; telephones; television; and the Internet. 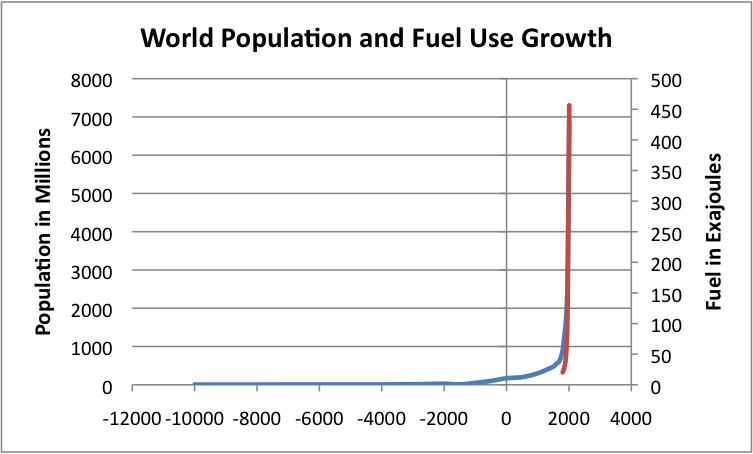 Figure 3 below shows that human population has risen remarkably since the use of modern fuels began in quantity about 200 years ago. Figure 3. World population from US Census Bureau, overlaid with fossil fuel use (red) by Vaclav Smil from Energy Transitions: History, Requirements, Prospects. Besides more and better food, sanitation, and medicine, part of what allowed population to rise so greatly was a reduction in fighting, especially among nearby population groups. This reduction in violence also seems to be the result of greater energy supplies. In the animal kingdom, animals similar to humans such as chimpanzees have territorial instincts. These territorial instincts tend to keep down total population, because individual males tend to mark off large areas as territories and fight with others of their own species entering their territory. Humans seem to have overcome much of their tendency toward territoriality. This has happened as the widespread availability of fuels increased the use of international trade and made it more advantageous for countries to cooperate with neighbors than to fight with them. Having an international monetary system was important as well. Land, without buildings – The value of this land depends on (a) its location relative to other locations, (b) the amount of built infrastructure available, such as roads, fresh water, sewer, and grid electricity, and (c) the suitability of the land for growing crops. All of these characteristics are energy related. Land with good proximity to other locations takes less fuel, or less time and less human energy, to travel from one location to another. Infrastructure is capital goods, built up of embodied energy, which is already available. The suitability of the land for growing crops has to do with the type of soil, depth of the topsoil, the fertility of the soil, and the availability of fresh water, either from the sky of from irrigation. Education – Education is not available to any significant extent unless workers can be freed up from farming by the use of modern energy products. Students, teachers, and those writing books all need to have their time freed up from working in agriculture, through advanced energy products that allow fewer workers to be needed in fields. Howard T. Odum in the Prosperous Way Down wrote about education reflecting a type of embodied energy. Human Energy – Before the advent of modern energy sources, the value of human energy came largely from the mechanical energy provided by muscles. Mechanical energy today can be provided much more cheaply by fossil fuel energy and other cheap modern energy, bringing down the value of so-called “unskilled labor.” In today’s world, the primary value humans bring is their intellectual ability and their communication skills, both of which are enhanced by education. As discussed above, education represents a type of embodied energy. Metals – Metals in quantity are only possible with today’s energy sources that power modern mining equipment and allow the huge quantities of heat needed for refining. Before the use of coal, deforestation was a huge problem for those using charcoal from wood to provide the heat needed for smelting. This was especially the case when economies tried to use wood for heating as well. Technology – Technology is a way of bringing together physical substances (today, often metals), education, and human energy, in a way that allows the production in quantity of devices that enhance the ability of the economy to produce goods and services cheaply. As I will discuss later, “cheapness” is an important characteristic of anything that is traded in the economy. As technology makes the use of metals and other energy products cheaper, extraction of these energy-related items increases greatly. Specialization – Specialization is used widely, even among insects such as bees and ants. It is often possible for a group of individuals to obtain better use of the energy at their disposal, if the various individuals in the group perform specialized tasks. This can be as simple as at the hunter-gatherer level, when men often specialized in hunting and women in childcare and plant gathering. It can occur at advanced levels as well, as advanced education (using energy) can produce specialists who can perform services that few others are able to provide. Technology and specialization are ways of building complexity into the system. Joseph Tainter in the Collapse of Complex Societies notes that complexity is a way of solving problems. Societies, as they have more energy at their disposal, use the additional energy both to increase their populations and to move in the direction of greater complexity. In my Figure 1 (showing my representation of an economy), more nodes are added to the system as complexity is added. In a physics sense, this is the result of more energy being available to flow through the economy, perhaps through the usage of a new technology, such as irrigation, or through using another technique to increase food supply, such as cutting down trees in an area, providing more farmland. As more energy flows through the system, increasingly specialized businesses are added. More consumers are added. Governments often play an increasingly large role, as the economy has more resources to support the government and still leave enough resources for individual citizens. An economy in its early stages is largely based on agriculture, with few energy inputs other than free solar energy, human labor, animal labor, and free energy from the sun. Extraction of useful minerals may also be done. As modern energy products are added, the quantity of energy (particularly heat energy) available to the economy ramps up quickly, and manufacturing can be added. As these energy products become depleted, an economy tends to shift manufacturing to cheaper locations elsewhere, and instead specialize in services, which can be provided with less use of energy. When these changes are made, an economy becomes “hollowed out” inside–it can no longer produce the basic goods and services it could at one time provide for itself. Instead, the economy becomes dependent on other countries for manufacturing and resource extraction. Economists rejoice at an economy’s apparently lesser dependence on fossil fuels, but this is an illusion created by the fact that energy embodied in imported goods is never measured or considered. The country at the same time becomes more dependent on suppliers from around the world. The way the economy is bound together is by a financial system. In some sense, the selling price of any product is the market value of the energy embodied in that product. There is also a cost (which is really an energy cost) of creating the product. If the selling cost is below the cost of creating the product, the market will gradually rebalance, in a way that matches goods and services that can be created at a break-even cost or greater, considering all costs, even indirect ones, such as taxes and the need for capital for reinvestment. All of these costs are energy-related, with some of this energy being human energy. Both (a) the amount of goods and services an economy produces and (b) the number of people in an economy tends to grow over time. If (a), that is, the amount of goods and services produced, is growing faster than (b), the population, then, on average, individuals find their standard of living is increasing. If the reverse is the case, individuals find that their standard of living is decreasing. This latter situation, one of a falling standard of living, is the situation that many people in “developed” countries find themselves in now. Because of the networked way the economy works, the primary way that this lack of goods and services is transmitted back to workers is through falling inflation-adjusted wages. Other mechanisms are used as well: fewer job openings, government deficits, and eventually debt defaults. If the situation is reversed–that is, the economy is producing more goods and services per capita–the way this information is “telegraphed” back to the people in the economy is through a combination of increasing job availability, rising inflation adjusted-wages, availability of new inexpensive products on the market place, and government surpluses. In such a situation, debt is likely to become increasingly available because of the apparently good prospects of the economy. The availability of this debt then further leverages the growth of the economy. Economists tell us that value comes from the chain of transactions that are put in place whenever one of us buys some kind of good or service. For example, if I buy an apple from a grocery store, I set up a chain of payments. The grocer pays his employees, who then buy groceries for themselves. They also purchase other consumer goods, pay income taxes, and perhaps buy oil for their vehicles. The employees pay the stores they buy from, and these payments set up new chains of transactions indirectly related to my initial purchase of an apple. The initial purchase of an apple may help also the grocer make a payment on debt (repayment + interest) the store has, perhaps on a mortgage. The owner of the store may also put part of the money from the apple toward paying dividends on stock of the owners of the grocery story. Presumably, all of the recipients of these amounts use the amounts that initially came from the purchase of the apple to pay additional people in their spending chains as well. How does the use of oil or coal or even the use of draft animals differ from simply creating the transaction chain outlined above? Let’s take an example that can be made with either manual labor plus some embodied energy in tools or with the use of fossil fuels: shoes. If a cobbler makes the shoes, it will likely take him quite a long time–several hours. Somewhere along the line, a tanner will need to tan the hide in the shoe, and a farmer will need to raise the animal whose hide was used in this process. Before modern fuels were added, all of these steps were labor intensive. Buying a pair of shoes was quite expensive–say the equivalent of wages for a day or two. Boots might be the equivalent of a week’s wages. The advantage of adding fuels such as coal and oil is that it allows shoes to be made more cheaply. The work today is performed in a factory where electricity-powered machines do much of the work that formerly was done by humans, and oil-powered vehicles transport the goods to the buyer. Coal is important in making the electricity-powered machines used in this process and may also be used in electricity generation. The use of coal and oil brings the cost of a pair of shoes down to a much lower price–say the equivalent of two or three hours’ wages. Thus, the major advantage of using modern fuels is that it allows a person’s wages to go farther. Not only can a person buy a pair of shoes, he or she has money left over for other goods. The fact that the wage-earner can now buy additional goods with his income sets up additional payment chains–ones that would have not been available, if the person had spent a large share of his wages on shoes. This increase in “demand” (really affordability) is what allows the rest of the economy to expand, because the customer has more of his wages left to spend on other goods. This sets up the growth situation described above, where the total amount of goods and services in the economy expands faster than the population increases. Thus, the big advantage of adding coal and oil to the economy was that it allowed goods to be made cheaply, relative to making goods with only human labor. In some sense, human labor is very expensive. If a person, using a machine operated with oil or with electricity made from coal can make the same type of goods more cheaply, he has leveraged his own capabilities with the capabilities of the fuel. We can call this technology, but without the fuel (to make the metal parts used in the machine, to operate the machinery, and to transport the product to the end user), it would not have been possible to make and transport the shoes so cheaply. All areas of the economy benefit from this external energy based approach that essentially allows human labor to be delivered more efficiently. Wages rise, reflecting the apparent efficiency of the worker (really the worker + machine + fuel for the machine). Thus, if a worker has a job in the economy affected by this improvement, he may get a double benefit–higher wages and plus the benefit of the lower price of shoes. Governments will get higher tax revenue, both on wages (because of the new value chain and well as the higher wages from “efficiency”), and on taxes paid relating to the extraction of the oil, assuming the extraction is done locally. The additional government revenue can be used on roads. These roads provide a way for shoe manufacturers to deliver their goods to more distant markets, further enhancing the process. What happens if the price of oil rises because the cost of extraction rises? Such a rise in the cost of extraction can be expected to eventually take place, because we extract the oil that is easiest and cheapest to extract first. When additional extraction is performed later, costs are higher for a variety of reasons: the wells need to be deeper, or in more difficult to access location, or require fracking, or are in countries that need high tax revenue to keep local populations pacified. The higher costs reflect that we are using are using more workers and more resources of all kinds, to produce a barrel of oil. Some would look at these higher costs as a “good” impact, since these higher costs result in new payment chains, for example, related to fracking sand and other products that were not previously used. But the higher cost really represents a type of diminishing returns that have a very adverse impact on the economy. The reason why the higher cost of oil has an adverse effect on the economy is that wages don’t go up to match this new set of oil production costs. If we look back at the previous example, it is somewhat like going part way back to making shoes by hand. Economists often remark that higher oil prices hurt oil importers. This is only half of the problem, though. Higher costs of oil production result in a situation where fewer goods and services are produced worldwide(relative to what would have otherwise been produced), because the concentrated use of resources by the oil sector to produce only a tiny amount more oil than was produced in the past. When this happens, fewer resources (including workers) are left for the rest of the world to produce other products. The growing use of resources by the oil sector is sort of like a growing cancer sapping the strength of a patient. Oil importing nations take a double “hit,” because they participate in the world drop in output of goods, and because as importers, they miss out on the benefits of extracting and selling oil. Another way of seeing the impact of higher oil prices is to look at the situation from the point of view of consumers, businesses and governments. Consumers cut back on discretionary spending to accommodate the higher price of oil, as reflected in oil and food prices. This cutback triggers whole chains of cutbacks in other buying. Businesses find that a major cost of production (oil) is higher, but wages of buyers are not. They respond in whatever ways they can–trimming wages (since these are another cost of production), outsourcing production to a cheaper part of the world, or automating processes further, cutting more of the high human wages from the process. Governments find themselves saddled with more unemployment claims and lower tax revenue. In fact, if we look at the data, we see precisely the expected effect. Wages tend to rise when oil prices are low, and lose the ability to rise when oil prices are high (Figure 5). The cut off price of oil where wages stop rising seems to be about $40 per barrel in the United States. Figure 5. Average wages in 2012$ compared to Brent oil price, also in 2012$. Average wages are total wages based on BEA data adjusted by the CPI-Urban, divided total population. Thus, they reflect changes in the proportion of population employed as well as wage levels. What if oil prices are artificially low, on a temporary basis? The catch is that not all costs of oil producing companies can be paid at such low prices. Perhaps the cost of operating oil fields still in existence will be fine, and the day-to-day expenses of extracting Middle Eastern oil can be covered. The parts of the chain that get squeezed first seem to be least essential on a day to day basis–taxes to governments, funds for new exploration, funds for debt repayments, and funds for dividends to policyholders. Unfortunately, we cannot run the oil business on such a partial system. Businesses need to cover both their direct and indirect costs. Low oil prices create a system ready to crash, as oil production drops and the ability to leverage human labor with cheaper sources of energy decreases. Raising oil prices back to the full required level is likely to be a problem in the future, because oil companies require debt to finance new oil production. (This new production is required to offset declines in existing fields.) With low oil prices–or even with highly variable oil prices–the amount that can be borrowed drops and interest costs rise. This combination makes new investment impossible. If the rising cost of energy products, due to diminishing returns, tends to eliminate economic growth, how do we work around the problem? In order to produce economic growth, it is necessary to produce goods in such a way that goods become cheaper and cheaper over time, relative to wages. Clearly this has not been happening recently. The temptation businesses face in trying to produce this effect is to eliminate workers completely–just automate the process. This doesn’t work, because it is workers who need to be able to buy the products. Governments need to become huge, to manage transfer payments to all of the unemployed workers. And who will pay all of these taxes? The popular answer to our diminishing returns problem is more efficiency, but efficiency rarely adds more than 1% to 2% to economic growth. We have been working hard on efficiency in recent years, but overall economic growth results have not been very good in the US, Europe, and Japan. We know that dissipative systems operate by using more and more energy until they reach a point where diminishing returns finally pushes them into collapse. Thus, another solution might be to keep adding as much cheap energy as we can to the system. This approach doesn’t work very well either. Coal tends to be polluting, both from an air pollution point of view (in China) and from a carbon dioxide perspective. Nuclear has also been suggested, but it has different pollution issues and can be high-priced as well. Substituting a more expensive source of electricity production for an existing source of energy production works in the wrong direction–in the direction of higher cost of goods relative to wages, and thus more diminishing returns. Getting along without economic growth doesn’t really work, either. This tends to bring down the debt system, which is an integral part of the whole system. But this is a topic for a different post. The reader will note that in my analysis, I am using the cost (in dollars or other currency unit) of energy production, including indirect costs that are hard to measure, such as needed government funding from taxes, the cost of interest and dividends, and the cost of new investment. The academic world uses other metrics that purport to measure energy requirements. These do not measure the same thing. Caution is needed in using these metrics; studies using these metrics often seem to recommend using a source of energy that is expensive to produce and distribute when all costs are considered. My analysis indicates that high-cost energy products promote economic contraction regardless of what their EROEI or Life Cycle Assessment results would seem to suggest. This entry was posted in Financial Implications and tagged dissipative structure, economic growth, low oil price, networked economy, oil price. Bookmark the permalink.